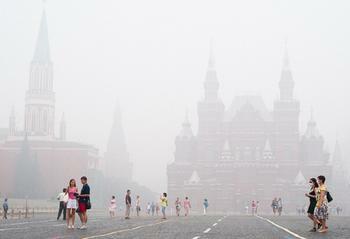 MOSCOW, Russia, August 9, 2010 (ENS) – The temperature soared to 40 degrees Celsius, or 104 Fahrenheit, on the streets of Moscow today, and coupled with smog from wildfires and a magnetic storm from solar radiation, is creating a public health emergency. Across central Russia and in the Moscow region crews are fighting hundreds of wildfires touched off by the heatwave, unprecedented since recordkeeping began 130 years ago. Smoke from the fires has spread across Europe as far as Finland. The forest fires can be linked to climate change. According to Russian meteorological agency Rosgidromet, a number of dangerous climate phenomena, which include waves of very hot and dry weather that trigger wildfires, have doubled during the past 15 years. In the capital city, hundreds more people than usual are dying. “The mortality rate has doubled from between 360 and 380 people per day in normal times. Today, we are around 700,” Andrei Seltsovsky, Moscow’s health department chief, told city government officials during a meeting Monday. Russia’s health ministry issued a statement denying Seltsovsky’s figures. But staff at Moscow’s morgues told reporters today that 449 people died in the past 24 hours in the capital. Muscovites are wearing masks as they go about their daily business and are seeking the shelter of air conditioned buildings and malls. Central Russia has been plagued by wildfires since early July and more fires are breaking out as quickly as crews can extinguish them. Russia’s Emergency Situations Ministry, EMERCOM, said today that firefighters are battling 247 new fires that arose over the past 24 hours, while 239 fires were extinguished. The death toll just from wildfires has reached 50, the EMERCOM information department said on Thursday. 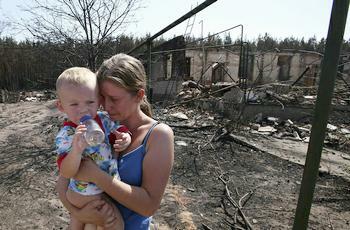 “The Emergency Situations Ministry and other state institutions are taking all possible measures to bring the fires under control and, most important of all, save people,” said Medvedev, who has directed the Defence Ministry and other law enforcement, security and defence agencies to join in this work. WWF-Russia says the situation is being made worse by existing forest laws which put expensive fire prevention measures in the hands of renters in and around forested areas. In forests not under rent, fire prevention responsibilities fall on the local authorities. These measures call for the construction of roads for fire fighting vehicles, landing grounds for fire fighting helicopters, creation of firebreaks, and maintenance of fire fighting equipment. “As a rule, these expensive activities are a heavy burden for small and medium renters, and therefore anti-fire measures are a pure formality,” says Nikolay Shmatkov, WWF-Russia forest policy coordinator. Prime Minister Vladimir Putin Monday received an offer of help from EU Commissioner for International Cooperation, Humanitarian Aid and Crisis Response Kristalina Georgieva. In a phone conversation, Georgieva said that the European Commission is considering the possibility of helping Russian children whose families have been affected by forest fires and the firefighters who took part in extinguishing the worst wildfires. Russia’s worst drought in decades also has affected world grain markets. Wheat prices are spiking faster than they have in more than 30 years, and Russian officials fear a possible food crisis. Prime Minister Putin warned on Monday that the harvest could be as low as 60 million tonnes, lower than expected. He announced a grain export ban from August 15 to December 31, sending prices higher. Now, to add to Russia’s woes, a geomagnetic storm has hit the Earth. Scientists say minor magnetic storms have negative effects on the human body. Inability to sleep and poor performance at work, irritation and nervousness may be felt even by healthy people, doctors warn. Yet they say that only sleep and rest can help. Experts advise taking prescription drugs in advance, and avoiding physical and emotional stress.